Last week I was busy with my daughters high school graduation and then we went out of town to watch her boyfriends soccer team so this is my first day crafting in over a week! I wanted to make sure that I played along with this weeks challenge over at the Jingle Belles blog, which is all about bright colors. Now when I pulled out the paper I used for my card I see "bright". Its pink and a green that's a lot more vibrant than I would use for Christmas. I'm very traditional when it comes to Christmas colors so these colors are really out of my comfort zone. They seem kind of calm in the photo but I promise, this card is pretty bright in person! If I get time tomorrow I may try another card with a bright yellow, something you really wouldn't think Christmas for! 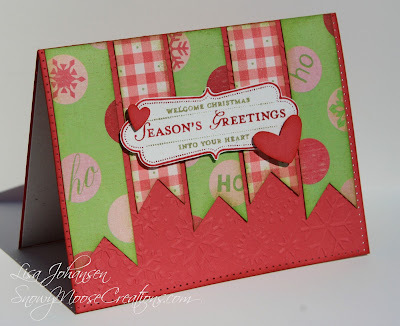 What a ho ho ho happy card ... love those colors for the holidays ... so glad you joined us at jingle belles. Ah, pink. Love it! Works so well. Cute design and a great mix of paper and what a lovely sentiment tag. I had to come and check this one out, Lisa! I think it's perfectly Merry and Bright! Love all the flags and the selection of paper!